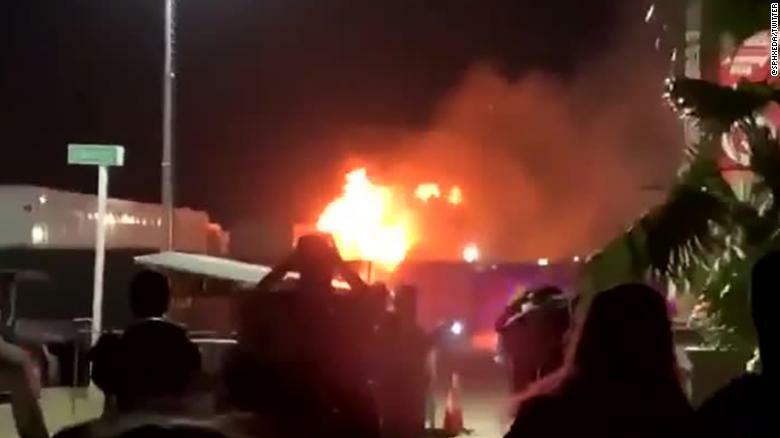 (CNN) A fire broke out early Saturday at the Coachella music festival in Indio, California, authorities said. No injuries were reported. The fire, at a mobile shower unit at the Empire Polo Club grounds, was reported at 2:06 a.m. local time, Riverside County Fire Department said. Four engines responded to the scene, near the center of the venue. One trailer was damaged, while a second was destroyed, they said. How the fire started wasn't immediately clear. The fire sparked just days after a longtime Coachella worker fell to his death while setting up for event. Concertgoer Lauren Levy, who witnessed the fire, said it brought back painful memories of a recent California wildfire. "My fiancé, Marcel Vigneron, and I have an RV in the corner area close to where the fire was. It all happened a few minutes after 2 a.m., and the flames got high quickly," Levy said. "We were told at one point we had to vacate the premises, but then we were told it was OK and we could stay." "There are many firefighters around here, thankfully, so they were able to put it out quickly, thank goodness, but what a scare," she added. "We were evacuated from our home in Malibu in November, so this shook me up, seeing fire so close again. The flames got high." Other event performers include Kacey Musgraves, Blackpink, Janelle Monáe, Los Tucanes De Tijuana, Bad Bunny, Khalid, Ella Mai, H.E.R. and actor Idris Elba, who is also an accomplished DJ. YouTube will offer a curated live stream of both weekends' performances, a first for the video-sharing site.